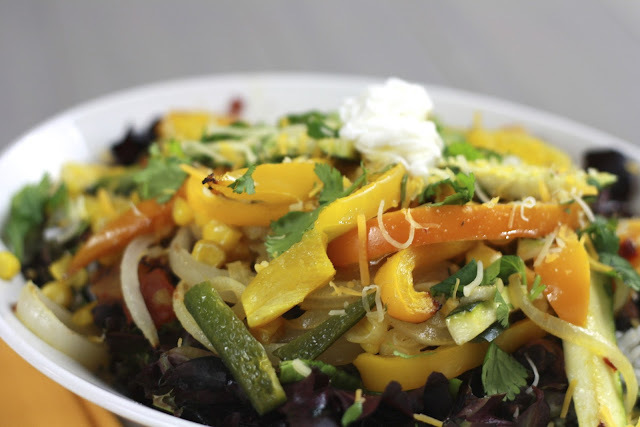 One of my all-time favorite meals, stacked roasted vegetable enchiladas, comes from Perry's Plate, so I went in with high expectations when I made this Chipotle-Roasted Vegetable Layered Salad one weekend. Thankfully, it did not disappoint! The great thing about this is how adaptable it is. Lay out the ingredients and let everyone build their own salad. Although I stuck pretty closely to Natalie's version, it would be easy to add chicken or beef to the line up as well. My sister Julia and her fiance Nate joined us for this meal and we each piled our bowls high with greens, rice, beans, and veggies before topping them with salsa, cheese, sour cream, and cilantro. Served with tortilla chips on the side, I almost felt like I was eating my favorite burrito bowl from Chipotle. Next time I'll make one of those copycat Chipotle rice recipes to make it even more reminiscent of my favorite! You can't go wrong with this delicious and healthy meal! 1. Preheat the oven to 425F. In a small bowl, whisk together the oil, chipotles, and cumin. 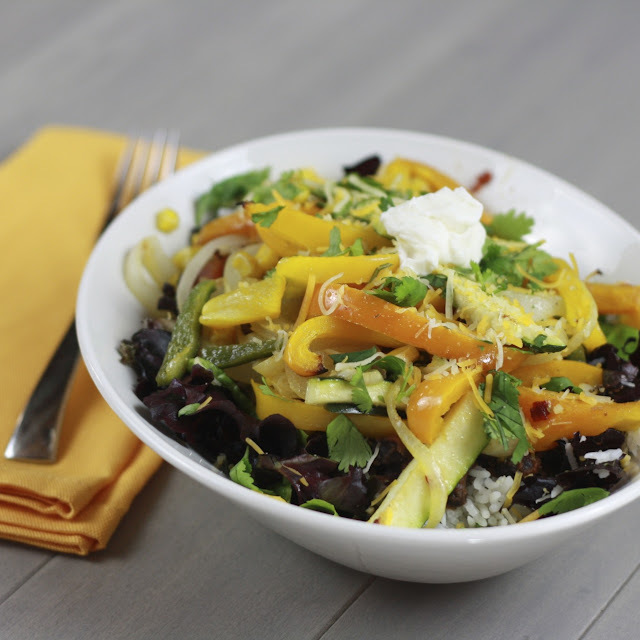 Toss in a large bowl with chopped vegetables. Season with salt and pepper, to taste. Lay vegetables out on a foil-lined baking sheet. Roast for 35-40 minutes, stirring every 10 minutes. 2. To prepare the beans, place the drained and rinsed beans in a small saucepan with 2-3 tbsp of water. Add cumin, salsa, and a bit of salt. Simmer beans over medium until heated through. 3. Assemble salads by beginning with greens. Top with rice, beans, vegetables, and desired garnishes (salsa, chipotle, cheese, etc).